I just witnessed it again (that's why I'm writing about it). Our cats love cheap cat "toys". Most were never intended to be cat toys but the cats love them more than the not-so-cheap ones we buy for them that ARE intended to be for cats. 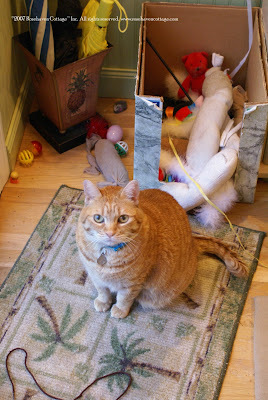 In this photo of Dee Dee (taken in the Tiki Room of Rosehaven Cottage) you will see our sweet queen matron cat sitting in front of the "toy box". It is actually one of those cardboard boxes you can get at Costco to carry out your groceries and I covered it with contact paper. The box itself was a kitty favorite for some time and became such a fixture (albeit an ugly one) that I had to do something to make it look better in our home. Then we came upon the idea of putting all their toys in it since the open front makes it easy for them to access the toys and dig through it (believe me, they do!). Notice in the photo all the toys spilling forth from the toy box. And notice that there are a number of store-bought toys in the bunch. But the astute viewer will also notice that there are some homemade stuffed socks on top as well as shoestrings strewn on the floor. Anything on top, coming out the front, or on the floor in the vicnity of the toy box is a favorite that they've dug for, retrieved, dragged out to play with, and/or carried around the house and left in an odd location for me to put back. Like little toddlers, they are not good at putting away their toys and I have to go around and pick up the various and asundry socks and shoelaces and throw them in the toy box every day or so. In the above photo, you can see some of the socks that are a favorite choice. 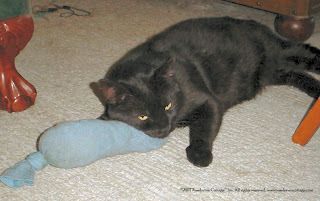 The sock toy as a cat toy came about in an interesting way. Early on, every time I put on my pantyhose for church or going out Dee Dee would come up to me and try to grab the hose from my hand. If she got a hold of it with her paw she'd shove it in her mouth and pull like the dickens until she ripped the pantyhose. That was a BIG kitty no-no! Dee Dee was banned from being in the room when I put on my pantyhose after that. But since every pair of pantyhose ends up with a run in them eventually, I figured out that I could knot one end, stuff poly-fill in it (another Dee Dee favorite evidenced by my punctured poly-fil bag in my studio), and knot the other end. Voile! Cheap cat toy! Dee Dee loved the first one and every successive one I've made for her. She cries as I make one, then grabs it away as soon as I let her have it, and proceeds to rip at the hose with her teeth until she's "gutted" the thing. We can't figure out what the allure is... maybe the sensation of "gutting" something. Who knows? Then I figured out that I could do the same thing with all those socks that suddenly show up without a mate or with a hole in it that I didn't want to darn. The original one I stuffed is still around (holes and all). It's a crusty dark blue sock with a healthy coating of kitty spit and cat food crumbs on it; poly-fill spilling out the gaping holes. It's Thomasina's favorite sock that she brings to us regularly in her teeth, meowing the whole time. I tried slipping it into a less nasty sock once, but she would have nothing to do with it once it was encased in a newer sock. So I removed it, and she's happy. There are more socks (like the one in the above photo with Tom Tom napping on it). They all get a lot of mileage throughout the house. Sometimes we wake up in the morning with 4 or 5 socks strewn about us on the bed and the floor next to the bed. Little night-time gifts from Thomasina. The kitties love shoelaces or trim. Suzette parades around the house with a long piece of braided trim from my trim box and yeows until we acknowledge her and her string. She doesn't want to play. She just wants acknowledgement. Then there's the brown shoelace that Thomasina loves and carries around. If she brings it to us, that means she wants to play. Yesterday, she climbed in the bathtub and I couldn't figure out why until she came out with the brown shoelace in her mouth and she draped it over the edge of the tub. That was the signal that she wanted to play. Apparently, she'd left it in the tub for safe keeping. Go figure! The other "cat toy" that is a big fave around here are shoeboxes (shown above with Gus Gus in an orange model and Lydia in a L.B. Evans model). Sometimes the box is a small fruit box or other food box of the same general dimensions as a large shoebox (and sometime as evidenced above a box that isn't meant to EVER have a cat in it--you gotta love dopey Gus Gus). We have to stash 2 or 3 next to the recliner in the living room because if one of us is sitting there relaxing in the evening at least one kitty (usually Dee Dee) will come up and paw at our front requesting that a box be placed on our lap for her/him to nap in. Once one kitty gets in a box, the other "copy cats" usually want to do the same thing. There are evenings that I've had two boxes, each with a cat in them, on my lap while I watch television to unwind. So when we get a new pair of shoes and the box is the right size for a kitty, one of the older boxes gets retired because it's blown out and a new one enters the rotation. 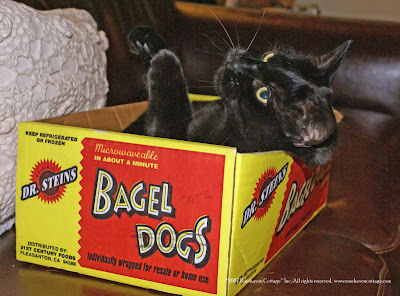 Currently, we have a hefty Bagel Dog box (pictured at left with Thomasina in it) that is a huge favorite and migrates around with my husband so Dee Dee can curl up in her box and still be by her "daddy" in his office or in the living room (she has him wrapped around her furry little apricot paw). 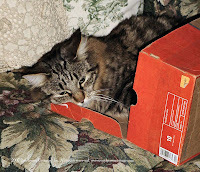 Thomasina (the resident Diva) often tries to crawl into it with Dee Dee in it but it's a one-kitty-only box. That usually results in a "changing of the cat" with Dee Dee getting out and Thomasina getting in, all happening in a matter of seconds. The kitties always seem to know where they left their toy last. I must really mess up their whole system with my cat toy sweeps that I do. I can just imagine what they're saying, "Mommy! You put my toys in that box again and I had to dig for it! Leave my toys where they belong... on the floor!" I love every kind of toy, even a wadded up piece of paper. My toybox stays put away until it is time to pick out more toys. I like your open toybox policy much, much better. I am going to ask my Mommie to make me a sock toy. Thanks for the good idea! Yes, my cats love the 'cheap' toys too! There have been times when I bring home some store bought cat toy that I think is wonderful, and my cats prefer to play with the bag the toy came in. Now I've found one brand of catnip toy that my cats are bonkers for, so I know I'll have a success anytime I buy one of them. But I'll have to try your homemade sock toy too (and add some catnip into it). By the way- I just discovered your gorgeous blog today, and I'm SO glad I did! It's wonderful. Fun post - I love the "nap" boxes!! I love it!!! 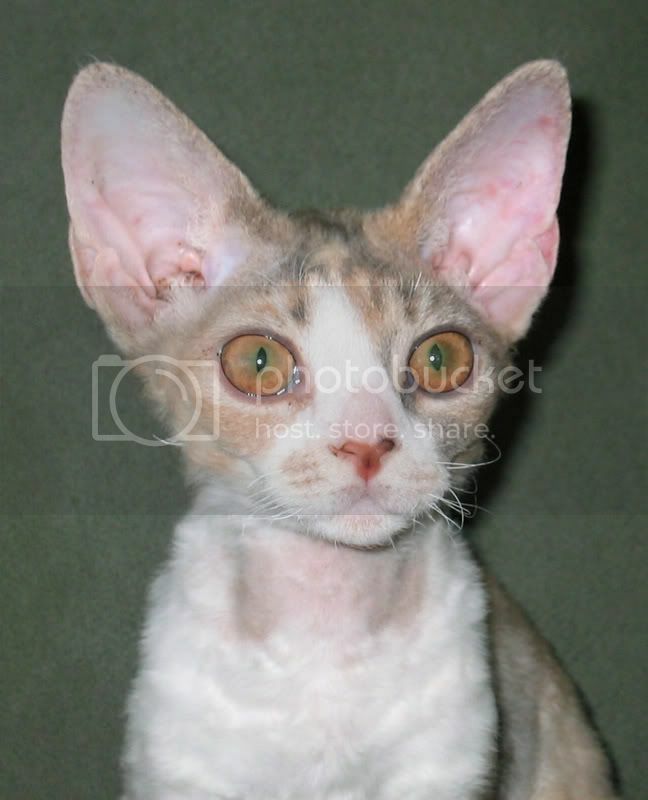 Wonderful kitties you have! Have you ever given your kitties the ring that's left after opening a jug of milk? Oh myyyyyyy.......Fun with a capital F for them! How adorable and creative! My cats are going to have even more toys, now! Thanks for your ideas.